Who Are Lions Clubs International? Lions Clubs International is the world's largest service club organization with more than 1.4 million members forming 46,000 clubs in 210 countries and geographical areas around the world. We're also one of the most effective. Our members do whatever is needed to help their local communities. Everywhere we work, we make friends. With children who need eyeglasses, with seniors who don’t have enough to eat, and with people we may never meet. What if you could Volunteer, Lead Projects, Gain Valuable Experience, Network, and Have Fun? You can with Lions Clubs International! Whenever a Lions club gets together, problems get smaller! And communities get better! That's because we help where help is needed – in our own communities and around the world – with unmatched integrity and energy! June 7, 2017 will be the centenary of Lions Club International. Catch a glimpse of 100 years of Lions history and service to our communities! Be inspired as you see Lions legacy of service come to life. Watch the current edition of Lions Quarterly. To watch individaul segments of this edition of Lions Quarterly, visit the Lions Quarterly. To watch earlier editions of Lions Quarterly, visit the Lions Quarterly Archive. LQ – Lions Quarterly video magazine shares inspiring stories of how Lions make a difference in communities around the world. LQ is posted in January, April, July and October of each year. Published in 20 languages, LION Magazine is the official publication of Lions Clubs International. The digital LION includes videos, archival stories, supplemental materials and links. Lions of Yesterday We served... and had fun. Lions of years ago were a lot like, well, Lions of today. Lions of Today The projects of contemporary Lions are incredibily divers... the diversity extends to the Lions too! Lions of Tomorrow No one knows the future, right? Well, Lions Clubs International has a pretty good idea of whaere we are headed... very soon!. Digital LION What is it about old movies that is so riveting? We've unconverted a treasure trove of decades-old Lions footage rarely seen, if at all. You'll laugh and shake your head in wonder as Lions serve, parade, and in sometimes half-crazy fashion, enjoy one another's company. Also listen to audio of Melvin Jones and a famous opera singer who helped Lions expand. 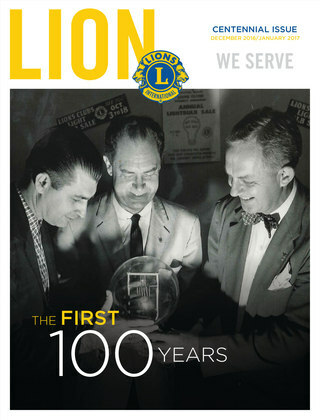 View the Centennial Edition of LION Magazine in a new window. Other issues of LION Magazine are available in digital format. The Yosemite Rim Fire is one of the worst wildfires in California history. Thousands of firefighters came to fight the fire and hundreds of Lions came together to serve. Lions helped American Red Cross set up the evacuation center. Lions volunteered to run the kitchen and prepare and serve meals for displaced people. With an emergency grant from the Lions Clubs International Foundation (LCIF), in addition to donations from local restaurants and food pantry, Lions are able to serve approximately 1,200 meals a day to fire fighters, Red Cross volunteers and evacuees. Millbrae and District 4-C4 Lions at the 2010 San Bruno Gas Explosion! On the evening of September 9, 2010 San Bruno was shaken by an explosion and assaulted by a huge inferno fueled by a ruptured 30” gas line. Homes and cars were immediately incinerated. People rushed out of their homes and away from the fire. Police closed roads, forcing many commuters living in unaffected neighborhoods to find shelter for the night. Nobody had to turn on the 5PM news to know there was a extraordinary fire in San Bruno, you only had to look at the enormous brown smoke in the sky. Milbrae Lions immediately leaped into action, deploying their new mobile emergency response kitchen to the City of San Bruno. Watch the video to see how Lions from San Bruno, Millbrae, Burlingame, Golden Gate, Brisbane, BASO, and South San Francisco were able to feed not just those displaced by the fire, but also the large number of firefighters, police, paramedics and other rescue workers on the scene battling the disaster. Learning is a lifelong process and Lions Clubs International believes all leaders can benefit from training. In support of this idea, Lions Clubs International provides an extensive variety of leadership training and development opportunities; through which current and future leaders can enhance their leadership skills. Lions Clubs International offers both the training, and the opportunity to practice those skills in real-life service projects. The leadership skills that make Lions Clubs International so successful are the same leadership skills businesses seek in their employees. Many companies are reducing or eliminating training. By becoming a Lion you can participate in the extensive range of leadership courses offered by Lions Club International (LCI) at little or no cost. Furthermore, you can gain valuable practical experience applying your newly learnt skills in a variety of hands on real-life projects that benefit your community, while meeting new people, and developing life-long friendships. Then apply those newly learnt skills at work, enhancing your value to your employer. Visit the Lions Learning Center to learn more about the extensive range of courses available. What Have Milpitas Gateway Lions Been Up To? Take a look at our Facebook page to see details of upcoming events and what we've recently been up to. Or check our Calendar to see upcoming events, which you are welcome to join us at. Want To Learn More About Lions Clubs International? If you live in or are visiting the Silicon Valley area of California, you are very welcome to visit and participate in one of our activities or a Milpitas Gateway Lions Club meeting. We meet on the first & third Tuesdays of each month from 6:30 to 8:30 PM -- in the Upstairs Meeting Room of the American Legion Post 564 at 2120 Walsh Ave, Santa Clara, CA 95050. Call Club Immediate Past President Lion David Martin at 408-829-1931 for more details. If Silicon Valley is a little too far for you to come, check the Lions Club International website's About Lions Clubs page, or use the Lions Club International Find a Club tool and enter your town or city in the search bar, then click "Search" to discover a Lions Club near you. There are Lions Clubs all around the world!